Let us bear that distinction in mind in looking at these last works of Mozart. Several years later in 1796 the twenty-six year old Beethoven staying in Prague would dedicate his two sonatas for piano and cello, op. 5 to the king. Like Mozart's quartet Beethoven's sonatas give an expanded role to the cello. In addition to the prominence afforded the cello this quartet demonstrates great unity among the movements. 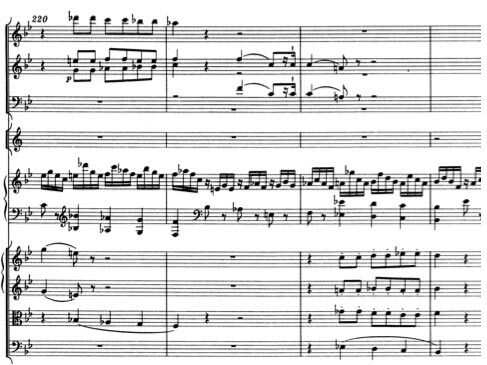 Too, as we saw in the final sonatas, Mozart utilizes a mix of thematic and contrapuntal development, often with close imitation as in the development (beginning m.78) of this quartet. 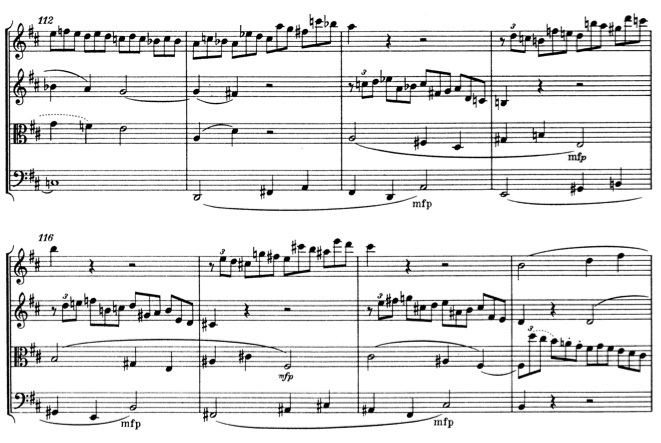 Introduced by the cello, the main theme of the final movement, below, hearkens back to the first two. We will see it to be the progenitor of the movement's wealth of material, again demonstrating Mozart's genius for coaxing material from a single theme. Below we see both types of development at once: the main theme imitated in inversion in the lower voices and a counter-melody same in the violins. Here too it is the rondo finale that receives contrapuntal treatment. It is also by far the shortest finale of this set, a feature which, when combined with the suddenness and brevity of the contrapuntal procedures and the short flitting figures, the 6/8 meter, and allegro assai tempo gives the movement a puckish, fleeting quality. This quartet too concludes with a contrapuntal finale, though this time in a more or less sonata form. It is also substantially more contrapuntal than any other movement in the set. Instead of flashes of imitation and inversion we have sustained fugato. Too this finale is essentially monothematic, with the main theme (below) always at the center or nearby. 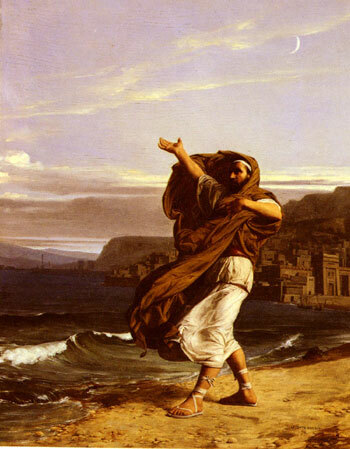 The rushing semiquavers sweep us along and the fugatos seems as whipped up tempests, though energetic as they rush they never startle or overwhelm. They are great but not terrible. The main theme, roused as it gets, is at heart breezy and genteel. Perhaps, though, this allegro is of a more intimate variety? Is there something personal about the "genteel" theme; is it more of a character? It is the only theme of the movement. Is there something autumnal about it, like the mood of the preceding menuet? Perhaps it makes a polite entrance, goes about its business, endures its share of storms, and makes a graceful exit. Quartet in F, KV.590. m.1-8: main theme. Mozart would eventually sell the set to publisher Artaria in June 1790 for what he called "a trifle." It was published posthumously the following year without any dedication to King Frederick. Artaria published these final quintets, KV.593 in D from December 1790 and KV.614 in E-flat from April the following year, in 1793. A. H. King suggested that due to their marked stylistic differences and similar title pages (both bore "composto per un amatore ungarese") Mozart perhaps conceived them as a pair [King, 56 ] (like the wind octets/serenades in E-flat and C minor, the last two symphonies, and the Concertos KV.488 and KV.491.) Too in both quintets the menuet is placed third among the movements, unlike the earlier quintets. Is there another piece in the entire chamber musical repertory whose beginning is its end; where the identical structure first sounds like the ideal opening and finally, like the only possible conclusion? String Quintet in D, KV.593. m.22-27. Perhaps not in chamber music, though Beethoven returns to the grave opening at the end of the first movement to the Sonata for Piano in C minor, Op.13. We see canonic procedures throughout the movement: in the exposition (of the dotted figure from m.28), in the development (of the descending figure of the main theme), and in the recapitulation (of the trilled figure of the main theme and the dotted figure from m.28) all of which stand out from the larghetto with its resigned figure and bass response and the vigorous call of the forte-piano figure of the main theme. Skiing along briskly against triplet figures it sweeps us up, but what is to become of it? It works its way down from the 1st violin to the viola, but when it gets to the bass it is rather a loose/free retrograde version of it which appears and which will be the subject of the following fugato. After the main theme returns at the recapitulation it shortly enters into counterpoint with the trilled subject. Quintet in A-flat. Allegro, incipit. 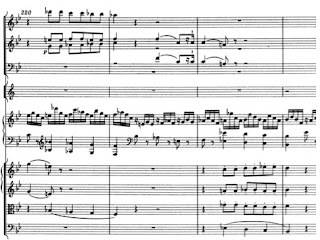 After a tease with canonic procedures Mozart throws the two halves, slightly modified, into a full and spirited fugato at m.111 until the restatement of the main theme in the minor. Now the five-note-figure opening in the viola is thrown against a response in the bass, which seems about to take it over until the opening figure is asserted forte by the violas and violins. The main theme is now re-stated four times, each against a different accompaniment, here against a triplet figure, there against a forte staccato scalar figure rising in stretto in the lower voices, then against a gentle piano figure in the second violin and first viola. At last it returns piano and in inversion in the first violin, before climbing up with a final re-statement forte in the lower voices and a long rising scalar figure in the first violin. Many listeners reasonably sense an autumnal quality to late Mozart, but with its jaunty theme, bright fugato and relentlessly fresh variations, not in this finale. Mozart wrote the following "Adagios and Allegros" in F minor for, "ein Orgelwerk in einer Uhr," or what we might call a "player organ" as in "player piano." This pair too is one of contrasting styles. –Dreyfus, Laurence. The Hermeneutics of Lament: A Neglected Paradigm in a Mozartian 'Trauermusik' Music Analysis, Vol. 10, No. 3. (Oct., 1991), pp. 329-343. –King, A. H. Mozart's Compositions for Mechanical Instruments: The Background and Significance. Musical times 88 (1947), 11-14; repr. in King, Mozart in Retrospect (London, 1956), 198-215. –Richards, Annette. Automatic Genius: Mozart and the Mechanical Sublime. Music and Letters 80, (1999), 366-8. –W. J. G. Ord-Hume, Arthur. Joseph Haydn and the Mechanical Organ. University College Cardiff Press. 1982. –W. J. G. Ord-Hume, Arthur. Ornamentation in Mechanical Music. Early Music, Vol. 11, No. 2 (Apr., 1983), pp. 185-193. Of the above essays I would recommend beginning with Schaper's, then Richards' essay for historical context, and Dreyfus' for [most excellent] insight into the musical language. Also note there is a third piece written for the occasion of Deym's "mausoleum," the Andante in F major, KV.616, which we will not be discussing here. The allegro in F major opens with a grand fanfare immediately falling into stretto. In the D minor section the seven-note figure plunges into contrapuntal procedure. The adagio returns but not in identical form. First, Dreyfus makes the most perceptive point that m. 125-132 form a compressed version of the earlier descents in m.8-20, making the fall to the tonic at m.128 an abrupt one of resignation. [Dreyfus, 341] Too it is adorned with gruppetti (figures of the trill family) first against the ostinato then in imitation over a dominant pedal point. A quaver figure arrives, moving from F to C in contrary motion in the voices before the rising-and-falling bass figure returns, this time rising to F and falling to C.
As with KV.594 the opening material returns altered. 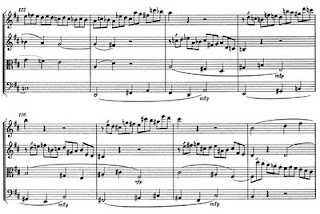 Here the fugue returns with a counter subject of rapidly alternating semiquavers which lends an even more frenetic character to the already frenzied fugue. Piano Concerto in B-flat, KV.595 - incipit, main theme. that at last when the second violin enters with the main theme and then the first a fifth above in canon we are blissfully overwhelmed. Dreyfus, Laurence. The Hermeneutics of Lament: A Neglected Paradigm in a Mozartian 'Trauermusik' Music Analysis, Vol. 10, No. 3. (Oct., 1991), pp. 329-343. Gutman, Robert W. Mozart: A Cultural Biography. Harcourt. 1999. Keefe, Simon P. (ed.) Cambridge Companion to Mozart. Cambridge. 2003. King, Alec Hyatt. Mozart Chamber Music. BBC Publications, London. 1968. 21. ". . . the two dedications will bring me something as well." Letter to friend and fellow mason in Vienna, Michael Puchberg. Vienna, July, 12 1789. 22. ". . . I am forced to sell my quartets, all that hard work, for a trifle, just to get some cash into my hands and meet my immediate obligations." To Michael Puchberg, Vienna before or on June 12, 1790. Dr. von Hildebrand is a retired philosophy professor. She taught for many years at Hunter College in New York City. She is the widow of Dr. Dietrich von Hildebrand, an Italian-born German philosopher, who, fleeing from the Nazis, set up shop at Fordham University, my alma mater, where he taught for several years before retiring. Both husband and wife distinguished themselves in their academic careers, and both managed to offend the administrative authorities. Dr. Alice von Hildebrand was the inspirer of a good many conversions in her days at Hunter (not known as a reservoir of Christian orthodoxy). In fact, I know one of her converts, though I've never had the privilege of meeting Dr. von Hildebrand herself. As for her husband, he wrote a number of fine books. By training, he was a phenomenologist, having been a student of Husserl and a friend of Scheler's. He lived long enough to see the decline and destruction of the Roman liturgy, against which he heartily protested. Dr. Alice von Hildebrand gives a wonderfully illustrated, elementary introduction to philosophy to a group of Catholic high school students. 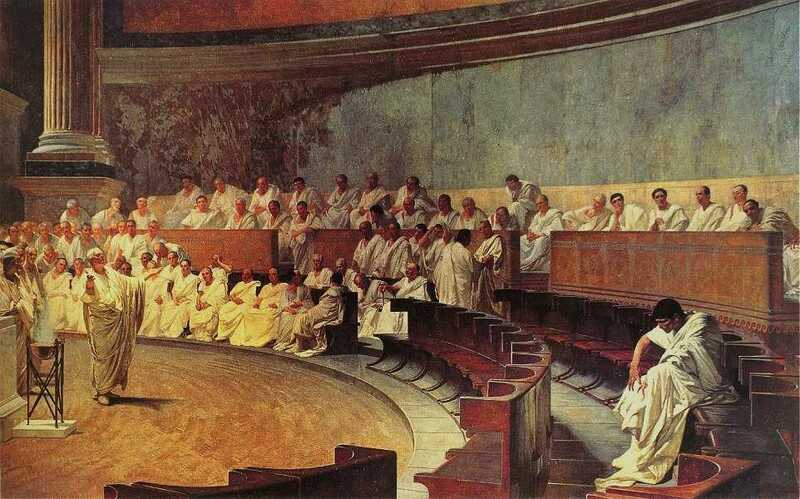 To hear her is to hear, by proxy, much of her husband's teaching as well---true philosophers, both of them! Alice Von Hildebrand STMA Lecture from Randy Luddy on Vimeo. Doubtless there are others who might be added to the list on further reflection. The thinkers listed above are by no means entirely or wholly compatible, one with another. And I would suggest that catholicity is a hallmark, or a deliberate choice on my part: to work out among various thinkers a system that is a synthesis of my favored theologians, philosophers, poets, and indeed, my own personal experience. In that vein, I'd like to highlight an author I've only begun to read: Charles Taylor. I have, of course, been familiar with him for some time, but never had the opportunity to read him. I'm now working through his book, Ethics of Authenticity, a book prompted by the Canadian thinker's reflections on the culture wars of Canada's neighbor to the south. The book promises much. And while I can hardly give my assent to all Taylor proposes, I am sure that the book will be the cause of further reflection on the history and nature of American liberalism, both individually and as part of a larger historical continuum within the English-speaking tradition. What I am suggesting is a position distinct from both boosters and knockers of contemporary culture. Unlike the boosters, I do not believe that everything is as it should be in this culture. Here I tend to agree with the knockers. But unlike them, I think that authenticity should be taken seriously as a moral ideal. I differ also from the various middle positions, which hold that there are some good things in this culture (like greater freedom for the individual), but that these come at the expense of certain dangers (like a weakening of the sense of citizenship), so that one's best policy is to find the ideal point of trade-off between advantages and costs. The picture I am offering is rather that of an ideal that has degraded but that is very worthwhile in itself, and indeed, I would like to say, unrepudiable by moderns. So what we need is neither root-and-branch condemnation nor uncritical praise; and not a carefully balanced trade-off. What we need is a work of retrieval, through which this ideal can help us restore our practice. To go along with this, you have to believe three things, all controversial: (1) that authenticity is a valid idea; (2) that you can argue in reason about ideals and about the conformity of practices to these ideals; and (3) that these arguments can make a difference. While convincing us that he is authentically modern, and on the whole happy about that (although rightly worried), he never quite gives his whole heart, mind, and soul to modernity. That is the way it must be with ethics, even regarding authenticity. Let me put this another way. Taylor is actually trying to reach, as best he can, the truth about modernity, and to do so in a wholly modern way. He is subverting modernity from within. He sees both its dangers and its true possibilities. He recovers it for reason. His is, then, as promised, a work of retrieval. Whatever problems I may have with Taylor's larger philosophy (and that remains, largely to be seen), his project is one with which I have complete sympathy.